Nukemap lets you simulate nuclear explosions on an interactive map. A science historian created the tool years ago but recently updated it. The new version uses real-time weather conditions to estimate a blast’s radioactive-fallout zones. The new version can also export data to 3D mapping software like Google Earth. Imagine a 150-kiloton nuclear bomb exploded in the city closest to you. Do you know how the city, its surrounding region, and its inhabitants would be affected? If you can’t think of much more than “a lot of people would die,” you’re not alone. “We live in a world where nuclear weapons issues are on the front pages of our newspapers on a regular basis, yet most people still have a very bad sense of what an exploding nuclear weapon can actually do,” Alex Wellerstein, a historian of science at Stevens Institute of Technology, wrote on his website, NuclearSecrecy.org. To help the world understand what might happen if a nuclear weapon exploded, Wellerstein created an interactive browser app called Nukemap. 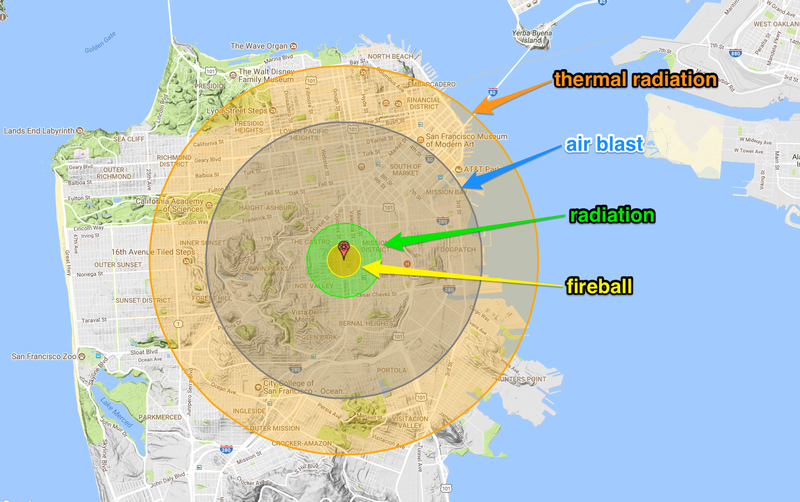 To illustrate that, Nukemap lets you build a hypothetical nuclear bomb and drop it anywhere on Earth. The software uses declassified equations and models about nuclear weapons and their effects — fireball size, air-blast radius, radiation zones, and more — to crunch the numbers, then renders the results as graphics inside Google Maps. Preset options let you pick historic and recent blasts, including North Korea’s latest test explosion and Tsar Bomba, the most powerful nuclear device ever detonated. The tool can even estimate fatalities and injuries for a given weapon yield, altitude, and location. The first version of Wellerstein’s tool came out in February 2012, but he upgraded it to version 2.5 this month. Users thus far have set off more than 124 million explosions in Nukemap. Nukemap 2.5’s new features let you see where a cloud of radioactive fallout might drift based on local weather conditions. Fallout refers to the dirt and debris that get sucked up by a nuclear blast, irradiated to dangerous levels, pushed into the atmosphere, and sprinkled over great distances. The updated tool also lets you export your scenarios, load them into mapping software like Google Earth, and explore them in 3D. “I hope that people will come to understand what a nuclear weapon would do to places they are familiar with, and how the different sizes of nuclear weapons change the results,” Wellerstein wrote on his site. We decided to test Nukemap 2.5 using its preset for the North Korean government’s underground test blast on September 3. Some experts think that device, perhaps a thermonuclear bomb, yielded an explosion of roughly 150 kilotons’ worth of TNT. This was the country’s most powerful nuclear explosion to date — about 10 times as strong as the Hiroshima bomb blast of 1945, which caused some 150,000 casualties. 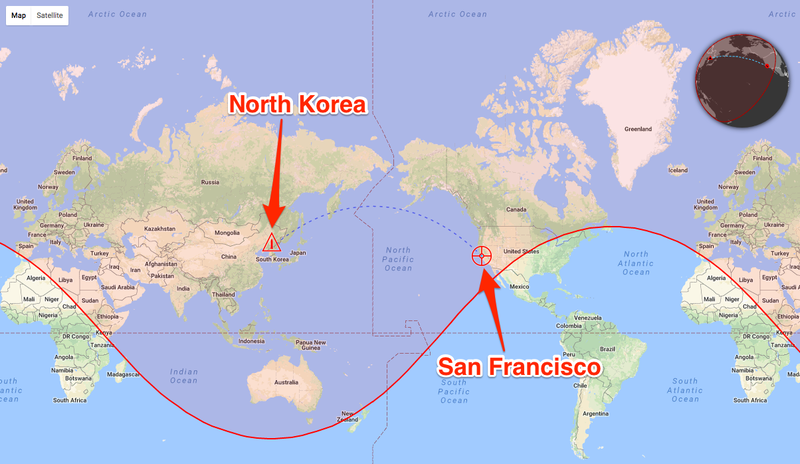 We started with San Francisco, since according to Missilemap — Wellerstein’s companion tool to Nukemap — the city is within the estimated range of Hwasong-14, North Korea’s newest and farthest-reaching intercontinental ballistic missile. 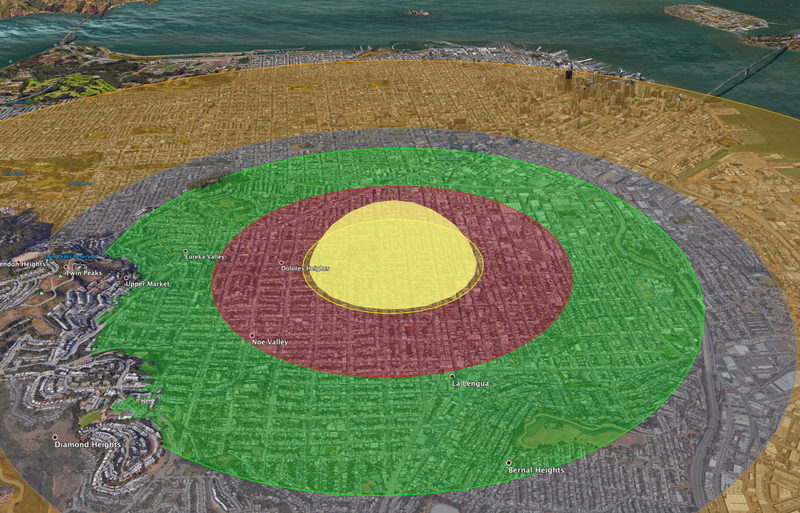 By default, Nukemap assumed a 150-kiloton-yield warhead would explode 1.03 miles above the city. An aerial detonation maximizes a nuclear bomb’s destructive power by allowing the blast’s energy to spread. If a bomb were to detonate on the ground, the soil would absorb more of that energy. Fireball (0.56 miles wide): In the area closest to the bomb’s detonation site, flames incinerate most buildings, objects, and people. 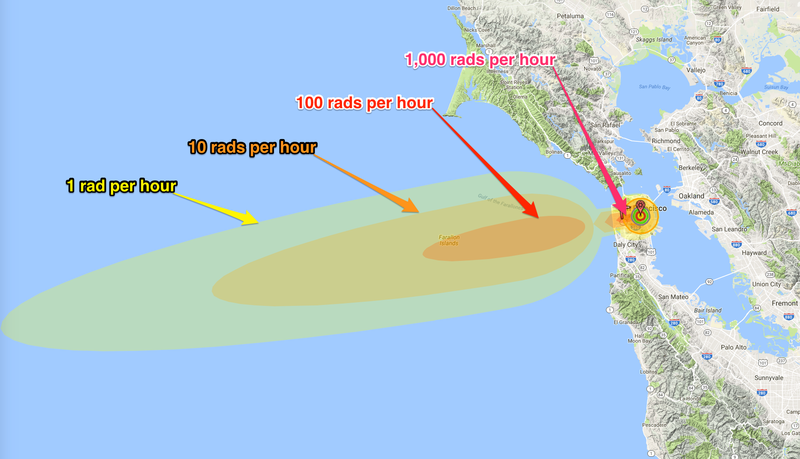 Radiation (1.24 miles wide): A nuclear bomb’s gamma and other radiation are so intense in this zone that 50% or more of people die within “several hours to several weeks,” according to Nukemap. Air blast (4.64 miles wide): This shows a blast area of 5 pounds per square inch, which is powerful enough to collapse most residential buildings and rupture eardrums. “Injuries are universal, fatalities are widespread,” Nukemap says. When we switched the height to “surface burst,” a very different picture emerged: The thermal and air-blast zones shrank, but the fireball nearly doubled in area, and the radiation zone nearly tripled. We also enabled the new radioactive-fallout settings based on local weather. And to see the human effects, we ticked the “casualties” option, too. Luckily, local winds in this hypothetical scenario were moving west-southwest, blowing most radioactive fallout into the Pacific Ocean. If a person were to stand outside in a 100-rad-per-hour zone for four hours, they would get 400 rads of radiation exposure, which is enough to kill 50% of people by acute radiation syndrome. According to Nukemap’s casualty estimator, however, this blast would still kill about 130,000 people and injure 280,000 over the next 24 hours. The tool says this does not include radioactive-fallout effects, among other caveats. We were eager to try the export feature, but it appears to need some work. For example, the fallout zone appeared in an area different from the in-browser calculation — almost due south of San Francisco, instead of west-southwest. But it was still useful — in a gut-wrenching way — to see the size of a nuclear fireball (the yellow half-dome in the image below) in 3D as it related to a major city, engulfing entire neighborhoods. 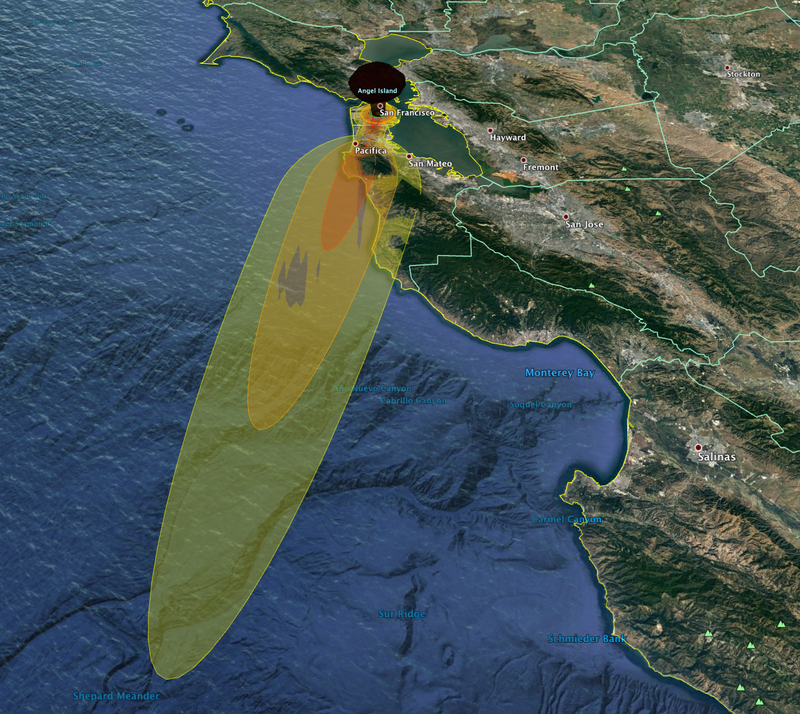 You can create your own nuclear-blast scenario and explore Nukemap 2.5’s options here. Wellerstein and others at Stevens Institute of Technology — based in Hoboken, New Jersey — are working on a related project, called Reinventing Civil Defense, which aims to “develop new communication strategies regarding nuclear risk that have high potential to resonate with a public audience.” The project was awarded a $500,000 grant and is expected to debut in 2019.